221-Neapolis . 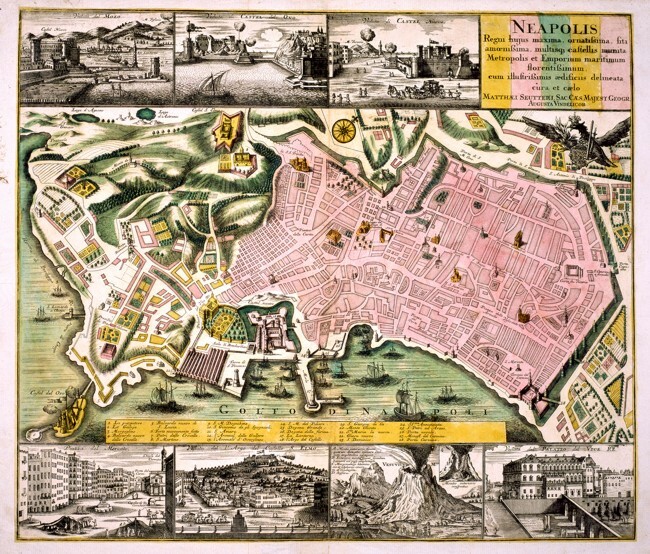 This map of Naples is surrounded by seven views of the town: At the top are the Molo, the Castel Nuovo and the Castel dell'Ovo, at the bottom appear the Piazza del Mercato, the Castello di Sant'Elmo, the Mount Vesuvius and the Palazzo del Viceré. It offers precise information of the town. 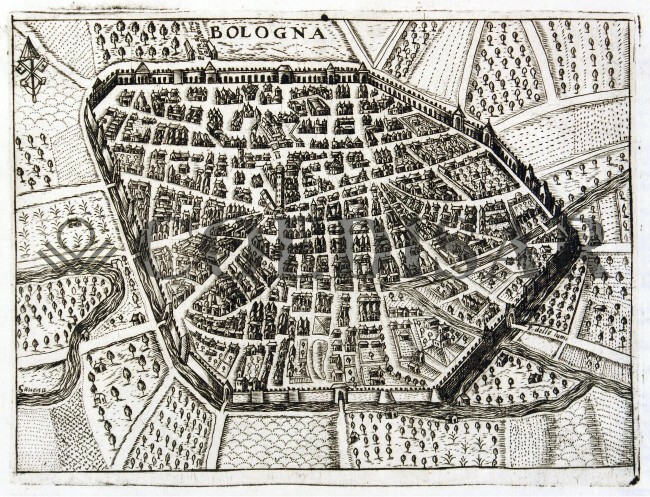 The most important buildings, the port in front of Castel Nuovo and numerous sailing boats are drawn on the map. 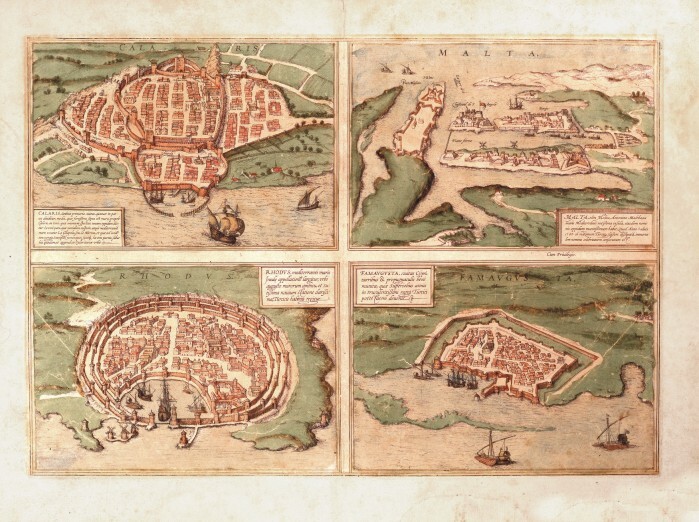 It measures 58 x 49,5 cm and comes from a Blaeu atlas of the 17 th century. 246-Roma - Veteris et modernae urbis romae - Ichnographia et accurati designatio ï¿½ cu . 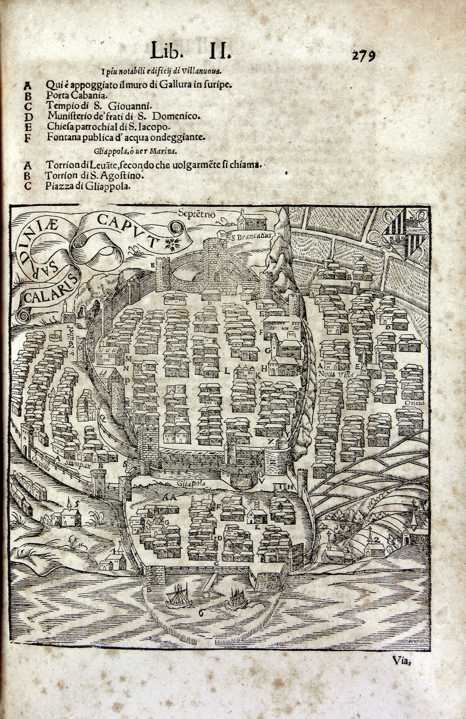 This map of Rome, drawn by Matthaeus Seutter, is written in German and contains useful indications of fourteen districts, the subdivision of the hills and other different information. It has many beautiful drawings and figures. It measures 57,5 x 49,5 cm. 259-Ticinum Vulgo - Pavia . 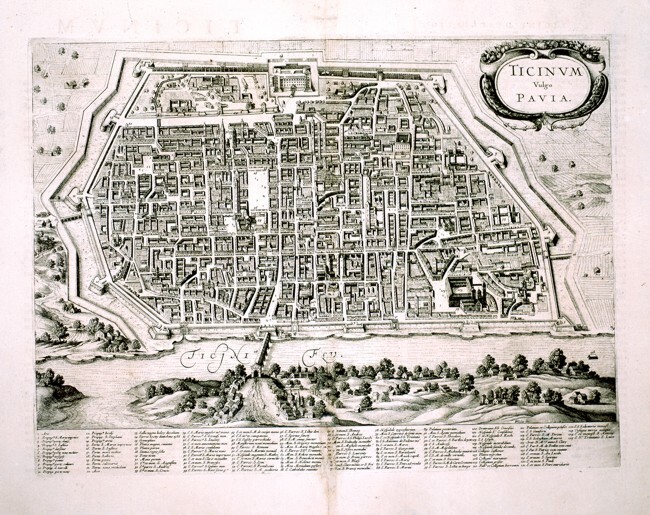 A nice perspective view of the town of Pavia, measuring 44,5 x 33 cm. At the bottom beneath the river Ticino, the map shows the names of the churches and the most important buildings. 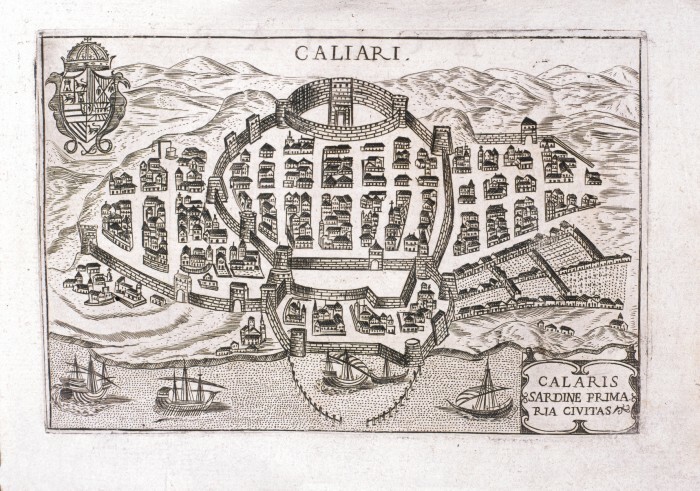 322-Map of Cagliari . 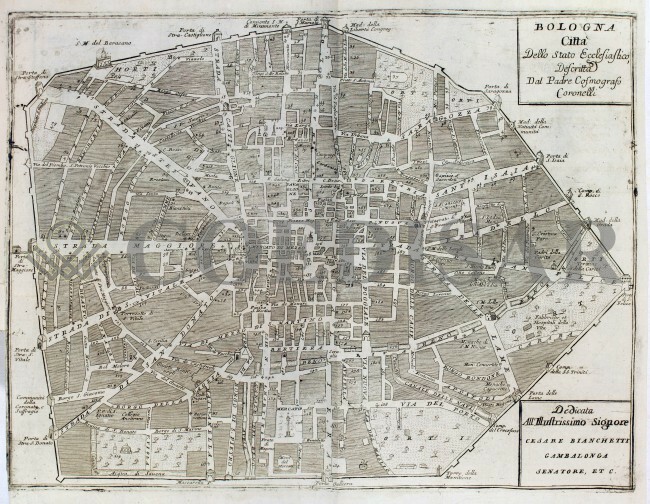 It measures 17,5 x 18,3 cm and resides on page 244 of Munster's atlas printed in 1775. 329-Catana Urbs Siciliae Clarissima . 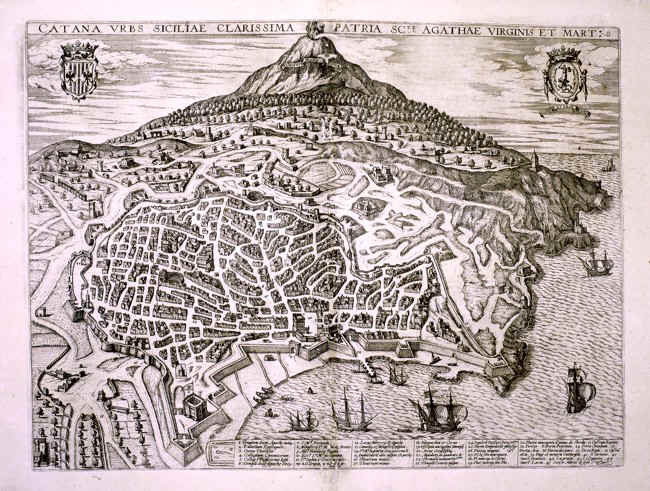 A black and white perspective view of the town of Catania with Mount Vesuvius in the distance. There are two decorative pictures at the top and many ships in the harbour. The most important buildings are described at the bottom. This map measures 49 x 36,5 cm. 330-Palermo . 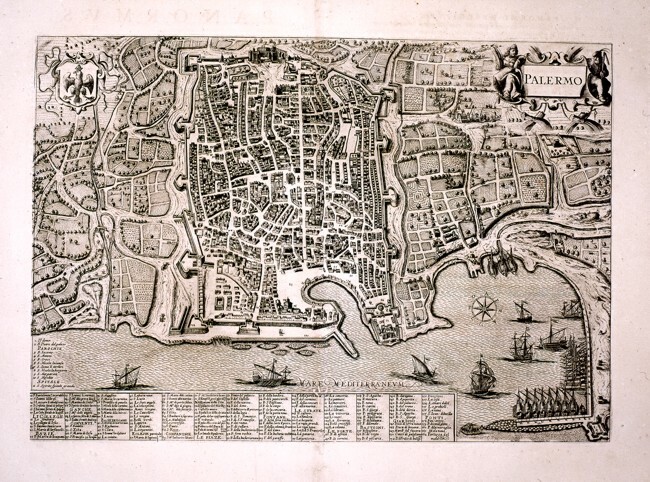 A black and white perspective view of the town of Palermo measuring 46 x 32 cm. There is a wind rose over the sea, two decorative pictures at the top and many ships at sea or in the harbour. At the bottom are described the most important buildings. 334-Siena . 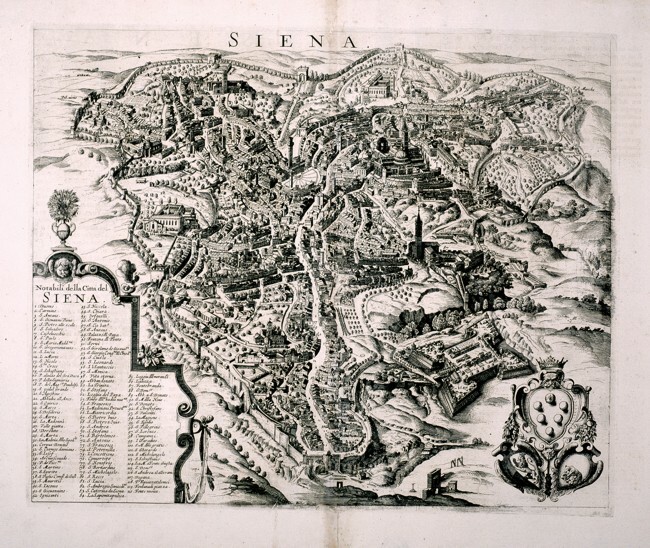 A black and white perspective map of Siena. On the bottom right appears a decorative picture and on the left there are the names of the most important buildings and places. This map measures 44 x36 cm. 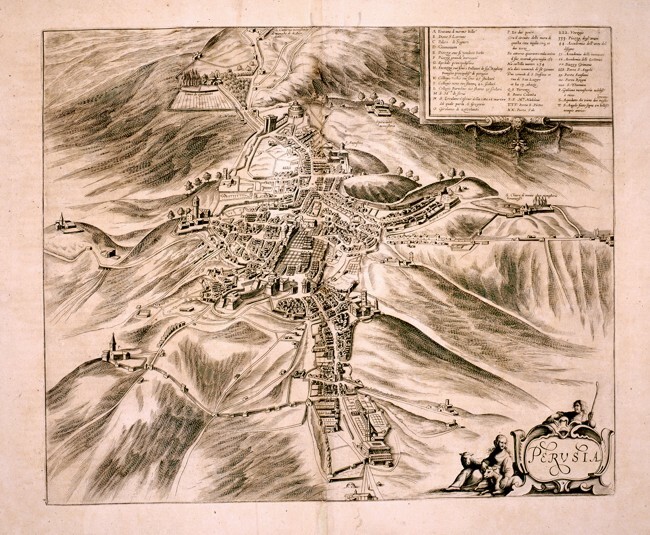 343-Perusia . The city of Perugia and the surrounding territories. On the top right a square contains the information on the most important buildings. At the bottom a decorative picture shows the title and allegorical figures. This black and white map measures 43 x36 cm. 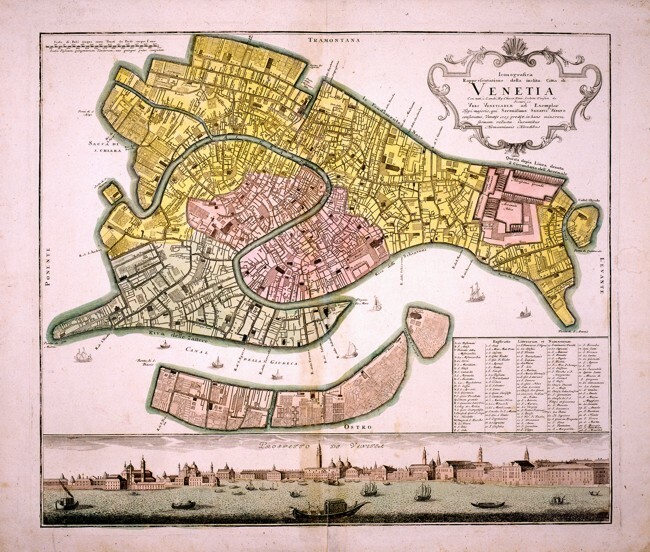 349-Venetia . Town map of Venice with a nice view at the bottom. The districts are shown with different colours and in a square on the bottom right, appears a description of the most important buidings. This finely-executed and interesting map of the 17 th century measures 55 x 47,5 cm. 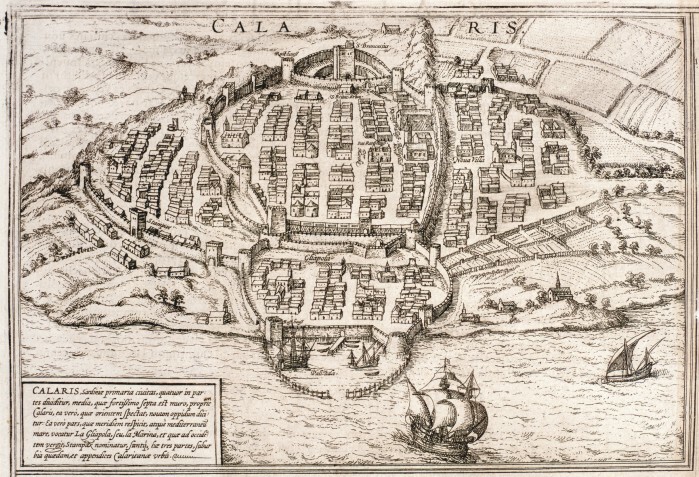 503-Cagliari . 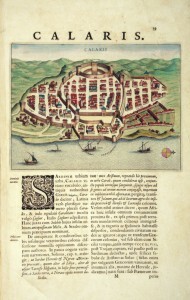 The map (18.9 x32 cm size), whose full title is Cagliari oder Calarsi die haupt und residentz Statt des vice Konigs in Sardinien, is located in the Atlas Atlas curieux, oder neuer und compendiuser Atlas published in Augsburg in1704. 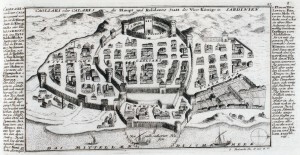 The paper, which is in black and white sets forth the plan of the city of Cagliari and sides of a description in German . 604- Calaris - Malta - Rhodus - Famavgvsta . 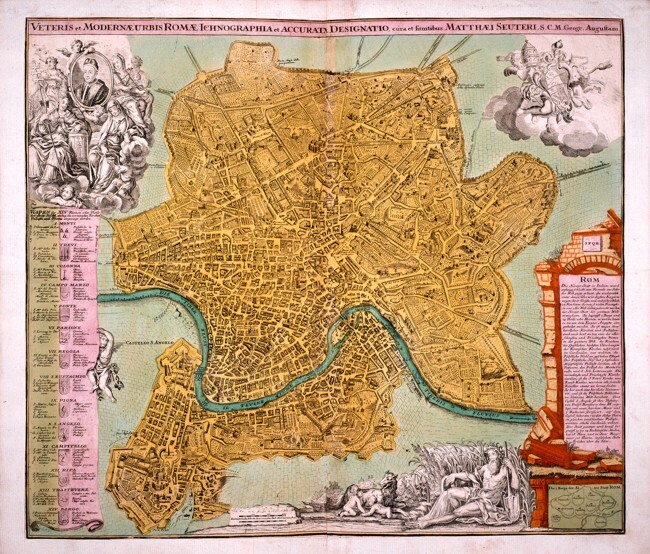 Colour map printed in Cologne in 1572 and contained in the Opera Civitates Orbis Terrarum by Georg Braun, who wrote the texts and Frans Hogemberg who engraved designs, it's a nice document representing the four cities and has been reproposed in numerous works without alterations whatsoever were used the same plates until consumarono. 610-Calaris Sardine Primaria Civitas .